If there were such a magical method, would you use it? Chances are you would. But of course you don't believe in magic. Neither do I. Nevertheless the method I describe above does exist. I call it EASYWAY. In fact it isn't magic, it just seems that way. It certainly seemed that way to me when I first discovered it and I know that many of the millions of ex-smokers who have successfully quit with the help of EASYWAY also view it in that light. No doubt you still find my claims difficult to believe. Don't worry, I would regard you as being somewhat naive if you just accepted them without proof. On the other hand do not make the mistake of dismissing them because you believe they are grossly exaggerated. In all probability you are only reading this book because of the recommendation of an ex-smoker who attended an EASYWAY clinic or read this book. It matters not whether you received the recommendation directly or via someone who loves you and is desperately worried that unless you quit, you won't be there to go on loving. How does EASYWAY work? That is not easy to describe briefly. Smokers arrive at our clinics in differing states of panic, convinced that they won't succeed and believing that even if by some miracle they do manage to quit, they will first have to endure an indeterminable period of abject misery, that social occasions will never be quite so enjoyable, that they will be less able to concentrate and cope with stress and that, although they might never smoke again, they will never be completely free and that for the rest of their lives they will have occasional yearnings to smoke a cigarette and will have to resist the temptation. The majority of those smokers leave the clinic a few hours later already happy non-smokers. How do we achieve that miracle? You need to book an appointment at an EASYWAY clinic to find out. However, what I can say is that most smokers expect us to achieve that objective by telling them of the terrible health risks that they run, that smoking is a filthy disgusting habit, that it costs them a fortune, and how stupid they are not to quit. No. We do not patronize them by telling them what they already know. These are the problems of being a smoker. They are not the problems of quitting. Smokers do not smoke for the reasons that they shouldn't smoke. In order to quit it is necessary to remove the reasons that we do smoke. EASYWAY addresses this problem. It removes the desire to smoke. Once the desire to smoke has been removed, the ex-smoker doesn't need to use willpower. 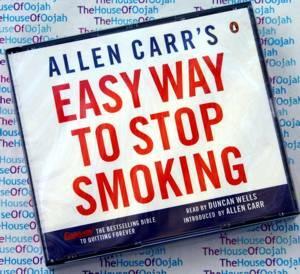 About the author Allen Carr discovered the Easyway to Stop Smoking in 1983-after his three-decade long, 100-cigarettes-a-day addiction had driven him to despair. First published in 1985, The Easy Way to Stop Smoking has sold over 5 million copies worldwide and has been translated into more than twenty languages. In addition to his books, Allen has established the Allen Carr clinics now operating in countries around the world.